Three males have made a private court appearance at Selkirk after a man was assaulted to his severe injury and robbed of his mobile phone. The 22-year-old victim was taken to Borders General Hospital for treatment on Sunday following an incident in the Howegate area when he suffered a serious head injury and was robbed of a mobile phone. 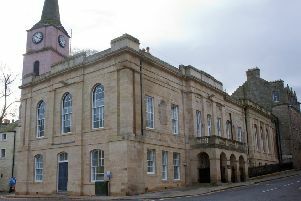 Thirty-year old-Gordon Elliot, David Adamson, who is 27, and 19-year-old Shane Adamson, all from Hawick, appeared on petition charged with assault to severe injury and robbery. Elliot faces additional charges of theft by housebreaking from business premises on Sunday, threatening and abusive behaviourand obstructing police. The Adamsons are also accused of threatening or abusive behaviour. All three made no plea or declaration and their cases were continued for further examination. Elliot and David Adamson were remanded in custody by Sheriff Peter Paterson, while Shane Adamson was granted bail.